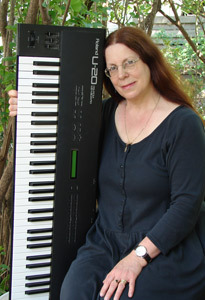 I have been writing and making music all of my life as a pianist, arranger, composer and music historian. My actual “career” in professional music began in my early twenties, playing ragtime piano at Pracna On Main saloon in historic Minneapolis on the banks of St Anthony Falls. In between gigs, I got my degree in music composition from the U of MN with an unofficial minor in music history (I spent a lot of time transcribing and archiving the music of Norwegian immigrant fiddlers for the U’s ethnomusicology department). I write arrangements for and play piano in several Celtic traditional bands for concerts and dances, research music of many eras, and write instrumental and choral music for small and large ensembles (including, occasionally, a new piece in traditional Irish or Scottish styles). I am composer-in-residence for the Minnesota Mandolin Orchestra and write a new piece for them annually. I don’t have just one style; I believe different musical styles inform each other and make for exciting and vigorous music that people love to listen to. My bands include Dunquin (traditional Irish), Dalwhinnie (Scottish), The New Pearl Buttons (mid-to-late-19th century American), Elite Rabble (music from Georgian and Regency periods, from 1760-1820, including British naval music and English Country Dance music) and Thistledown (Scottish dance). I also play piano in other bands; among them, the well-known Irish group formed by Paddy O’Brien, O’Rourke’s Feast. My greatest delight is researching music of different eras, then arranging and performing concerts with my various bands. I love presenting unique concerts, never giving the same performance twice. Some recent projects: a string quartet based on shape-note styles, a Scottish Island concert in a church hall, a new dance theatre piece based on the Scottish Selkie legend. There are no boundaries in music, and cross-fertilization invigorates new music. It is my pleasure to bring listenable and engaging music to new audiences.